Z Space is thrilled to have 13th Floor, one of the most exciting physical/movement oriented theater companies in the Bay Area at Z Below. What if getting struck by lightning felt so good, you wanted to do it over and over again? The storm of the century rumbles in the wings as five desperate, quirky souls attend a Lightning Strikes Anonymous meeting: John, who's been struck so many times he can't go near an ATM without shorting it out; Blake and Iris, who share an unhealthy need to hook up in empty fields when it starts to rain; Juliet, who has moved on to large appliances; and Paul, compelled to attend the meeting as part of his parole agreement. 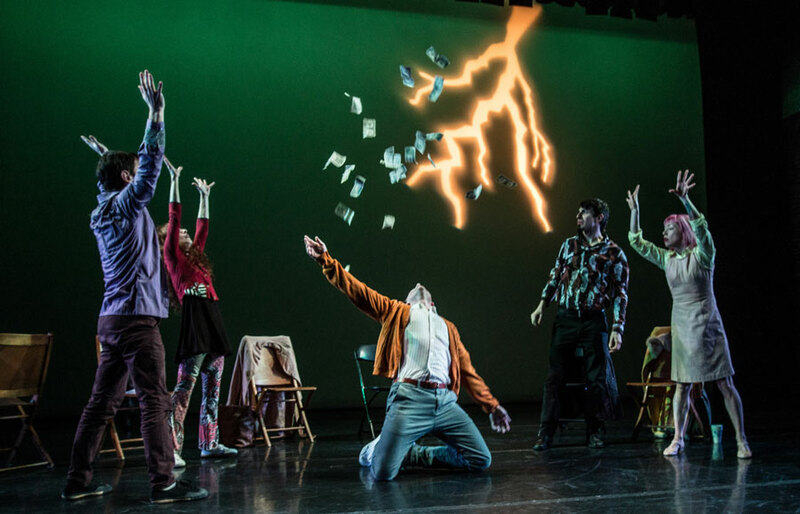 Through the fantastical stories of its unforgettable characters, Lightning Strikes Anonymous opens a new dialog about addiction and the way it's treated in American culture. Through a complex lens of darkness, humor, and hope, 13th Floor uses their unique brand of “theater that won’t hold still” to explore this difficult topic with signature thoughtfulness and wit. Running time 60 minutes with no intermission. "13th Floor combines theater and dance to create an enthralling hybrid about a most unusual addiction." "It incorporates the best of theatre – original thought, sparkling wit and well-structured narrative. But 13th Floor elevates it to a higher plane with the addition of movement...run to see this show before it closes."